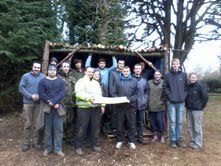 The Prince’s Trust Team Programme is being delivered by UKSA and YMCA for young people on the Isle of Wight. If you’re unemployed, aged 16-25 and looking for a new challenge, then this could be just what you are looking for. Team is a full-time, 12-week programme – it’s completely free and will not affect Jobseeker’s Allowance. The aim is to give young people a better chance of moving into employment, education or training. It’s also an opportunity for participants to make use of their current skills and learn from each other, while also acquiring a nationally recognised qualification. The programme includes a five-day multi-activity residential at UKSA, a community project, two weeks of work experience, and opportunities to produce or improve a CV. Most importantly, participants should get a big confidence boost and a real sense of achievement. The programme is also available for young employees who would like to develop interpersonal skills to help improve long-term career prospects. Applications must be in by Monday, Sept 16, and a selection day takes place on Friday, Sept 20 at YMCA Winchester House, Shanklin.